In this article I want to explain how powerful LucidControl USB IO Modules can be realizing Smart Home Automation projects. Many available systems for smart home applications on the market are closed which means that the have powerful functionality on one hand but it is difficult to extend them with other components on the other hand. A closed system has some major advantages which the inexperienced user find very helpful. But as soon as some special functions are needed things getting difficult and expensive. LucidControl goes a completely different approach which is addressed to the more experienced user which is e.g. able to write scripts. Even if there are some prerequisites the user has to have, things are kept simple always keeping an eye on the high flexibility of the system. LucidControl does not raise the claim of being a complete smart home automation system, but providing the necessary components for it. What does a home automation system consists of? Mainly, we can identify two parts. First, the software controlling the functionality. Second, the hardware for acquiring and controlling. The latter part LucidControl is able to do. This is something the user has to take care himself. By using our powerful Application Programming Interfaces (API) for Java and Python we create a complete object oriented and easy to use way to work with LucidControl. Of course this creates more word than buying a complete system. But this way gives you the whole flexibility you need for your application. Lets take an example. You want a valve to switch when a specific temperature raises above a value. 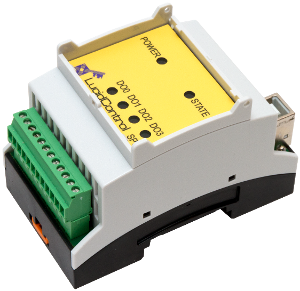 For such an application the only things needed is a LucidControl DO4 – Digital Output Module and a LucidControl RT4 – RTD Input Module and the special clue – the Raspberry Pi or the Beagle Bone. While the RT4 allows the measurement of the temperature sensors (actually up to 4) the DO4 generates the switching signal for the valve. Putting all this together in a small cabinet presents a complete customized and flexible automation solution based on a very powerful computer which is very cost effective – less than 250 €. Back to the software; For the explained thermostat function, switching a valve on and off the program has less than 50 lines of code. Get involved into Python which allows very straight forward programming. You will be impressed how powerful a script language can be. Also logging of the data and remote monitoring and control of the system via the internet works very simple – thanks to the Linux based Raspberry Pi and the Beagle Bone computers. Check out our product pages and get an overview what the powerful LucidControl IO Modules can do for you and your smart home. This article will be completed … Feel free to contact us.